The Garden Holiday Village is ideal for a relaxing holiday for two on the island of Mallorca. Enjoy the tranquility of this adult hotel with a large outdoor pool surrounded by beautiful gardens, Thai Chi and Pilates classes, sauna and a spacious restaurant. Wi-Fi is free throughout the hotel. Once a week, the main restaurant offers romantic candlelight dinners. Romance is not too short here. The way to the beach is about 750m, but you can easily travel with the hotel's shuttle bus. The surrounding area is ideal for hiking, horseback riding and water sports. The Garden Playanatural is an exclusive hotel for adults situated in El Rompido, in the province of Huelva. Overlooking the Atlantic Ocean and surrounded by the spectacular Río Piedras Marshes, this stunning natural landscape is the ideal choice for a romantic getaway, a break spent in the company of friends or simply an opportunity to feel at one with this fabulous Andalusian coastal setting. Based on quality, variety and originality, dining at the Garden Playanatural Hotel is an authentic delight and one of the many attractions that makes our hotel concept truly outstanding and unique. Surrounded by lush, vibrant nature, it’s easy to understand why the Garden Playanatural is the perfect choice for those looking to discover a range of sports activities and also for those trying to enjoy a well-deserved rest. The Garden Playanatural’s exclusive leisure offer is packed with large and small details that are guaranteed to make your stay a truly memorable experience, for couples or groups. 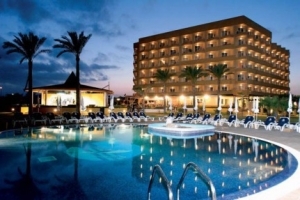 This adults only hotel is situated near the Cala Millor Beach. The famous Drac Caves of Majorca can be reached from here easily. Couples find at the Cala Millor Garden Hotel a several pools, sports facilities, like multi-sports courts, tennis court, fitness room, putting green, as well as wellness area with sauna, whirlpool and the possibility to enjoy massages. Evening entertainment and a relax atmosphere garantee a great holiday for couples, singles or a group of friends, older than 16 years. The rooms of the Cala Millor Garden Hotel feature air conditioning, free Wifi access, satellite TV, minibar, amazing views and terrace or balcony. Show-cooking can be enjoyed several times a week at the hotel's buffet restaurant during dinner, but also the snack bar and the pool side bar servs small snacks and drinks during the day.